On the threshold of a new beginning, a point of entering. There are many photos I could have used for this challenge but the choice was easy. This photo was taken in the mid 90s of my three children, dressed up for an Easter church service. I was not a girly-girl, never have been, and my daughter (Aspie D) was/is the same, but I did love to make her a new dress every Christmas and Easter because I loved to sew. I knew that she would happily wear the dresses when younger (and had no choice, awful mother that I am!) but I knew that it wouldn’t be for long before she refused so I got in there fast! Having made that year’s Easter dress and bought the boys proper shirts and trousers for the service, I thought it would be lovely to take a nice photo of them in the back garden/yard before we left for church. What matters now, is that we had settled in nicely and were on the threshold of a new beginning for our family. We were no longer homeowners but tenants and we faced a long climb back up to rebuild in every sense of the word, yet the five years that we went on to live in that house were the happiest for my marriage and our family life. Thinking, then, back to this time when I tried to take this photo and the kids just wouldn’t cooperate. 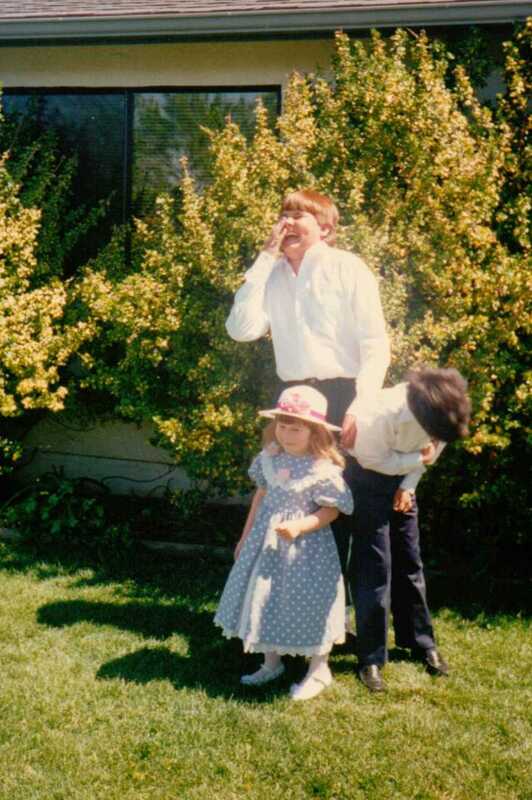 They were restless, wanted to get church over and done with so that they could get back home to the Easter Egg hunt we always held in our back garden, back to their soon-to-be devoured chocolate as any kid would. Trying to keep little Aspie D from running off and the boys from pawing at each other as boys do, never mind standing straight, proved to be impossible. In the end, just before I took one last shot, they exploded into fits of laughter. Taken on the threshold of our new life together, it turned out to be one of my most treasured photos, one which reminds me of deep-held memories that, despite our many challenges, we shared a good and rich family life in California filled to the brim with moments like these. I’m also reminded that this same richness plays out in the joy and laughter shared with my adult children today. This entry was posted in Childhood Memories, My California, Weekly Photo Challenge, Writing and tagged California, Childhood memories, Children, Easter, Family Life, laughter, Market Crash, postaday, Weekly Photo Challenge, writing. Bookmark the permalink. What a lovely story and heartwarming photo. Thank you, Sherri, for a lovely post. I did. I’m a sucker for happy family stuff, Disney / Dreamworks kids’ movies, and the like. Oh, I just love this photo, Sherri. It’s obvious there is joy in this family; a treasure to see. Haha! Yes, he still has those wonderful dimples and he still laughs like that. He has a great sense of humour and you can see Nicky is folded up in laughter 🙂 I’m laughing out loud now with you!! Ha! Yes, I’ll save that little bedtime story for later, but you can be sure I will definitely be writing about it. And it ‘ain’t pretty. But…there is a satisfactory ending but I shall keep you in suspense for now (sorry about that!). Right, I really must sign off now (already said night night!) so I’ll see you tomorrow! Hi Sherri! What a coincidence! I’ve just written a post regarding being on the threshold of a new beginning, and this post is the latest post in my WordPress reader! I love a good coincidence I do! And great photo – such fun and happiness… always a good combination to get off to a great start! I was the third child too and the only girl so I expect my mother wanted me to be a girly girl. Sadly for her I just wanted to do everything my big brothers did, and you are right, dresses just didn’t work! That explains it then! Same with me and my three. I had a tomboy for a daughter but then I was too so I suppose I didn’t mind too much 😉 I always wanted to be just like my brother!! Love the picture its so full of life and action. Now following and will return. Ian. Beautiful, rich powerful story and a lovely picture. Oh Sherri, what a great photo! Your oldest son’s expression is priceless. I love your daughter’s dress and her Easter bonnet…so sweet. Like you, I was never a girly, girly, but my mom liked to dress me up too. I can’t wait to hear more about the crazed neighbor! Ahh, thank you Jill, so glad you enjoyed this post. I did enjoy Easter and having the chance to go out and buy her Easter bonnets and new shoes. It became a tradition, until she refused to wear dresses any longer when she was 7 or 8. I wanted to get in as many dresses as I could! I liked wearing dresses for special occasions and I remember when I was really young my mum made my dresses too so as with you and your mum, it was a nice tradition to hand down. Although it goes without saying that my daughter wants nothing to do with sewing, knitting, or anything like that! What a cliff hanger reply, Sherri! I can’t wait for that post! Thank you, so glad you enjoyed it and LOL – that doll!! I am laughing right now at the thought of it! I must tell you though (and maybe I should write a post about it) my earlier sewing efforts were not exactly successful. In fact, yes, I will, and then you can see what I mean! Ironically, as I said to Jill, my daughter wants nothing to do with sewing at all!! I think the best photos are the natural ones that capture real memories like these. Yes, it’s nice to have the professional shots of the happy family posed obediently, but really, photos like yours capture the stuff of life. What a lovely and heartwarming picture, the joy still comes across and makes one smile. Thanks for sharing! What a gorgeous photo! That’s pure joy on your eldest son’s face. And what an amazing dress you made. You’re very clever! I look forward to your little bedtime story. How unsettling would it be to have such a nasty neighbor. Good thing nobody was physically hurt by your neighbor’s (mis)adventures. It was a very scary and troubling time and a situation we were very relieved to put behind us. I have a similar snapshot, two actually, that come from a time before some serious storms crashed through our life as a family.Unlike yours, I am the only one who sees mine, as they are imprinted in my memory, which means they are planted forever in my heart. It’s wonderful to have these moments, as they help us navigate the present. It’s no wonder the bible reminds us so often to remember the things God has done in the past; it helps build our faith when everything else screams to tells us we are abandoned; there is no hope. We know differently and your photo has reminded me of that again. Thank you for sharing it. Hi Julia, yes, these family photos are very precious indeed. I have some I keep private and others I feel I want to share here but I know what you mean. The five years we spent at this house were good ones but then came yet more storms and so having these good memories helps me to focus on the good we had and the good we have now, my children and I, and what we have all endured as a family, as you can very much understand. Yes, you are so right, remember what God has done in the past, that is something I have to remind myself to do. It gives so much hope and faith for the present and the future. When I started sharing my stories from my former life in California with my young children, at first I wondered if going back to the past was a good thing but then I realised that actually it was as then I was able to see that there were many good things to share and this did indeed give me great hope. What a precious picture! I can see why it’s one of your favorites. The dress is darling also. The rifle-toting neighbor is just scary! Easter mornings are very special, and you capture well your kids’ impatience through your photo and words. And of course the California sun is there too! Wow, all that rich sunlight, all that laughter – this is such a warm photograph! Really nice to see. Great answer to the challenge. So, who found the most eggs? 😛 I know who my money’s on. I’ll tell him that, it is very 90s isn’t it? Hmm, somehow I was right, how did I know that she would end up with all the eggs? Yes! It has been nice today. 17 degrees at one stage. Pretty comfortable – when we start climbing above the twenties is when I start melting! It’s funny how I get to thinking about the challenge a few days before and um and ah and then the light bulb goes off and I know just which photo to use and the rest centers around that. Thank you Lilka and yes, time sure does fly, too fast sometimes! I can’t believe that this photo is not far off 20 years old!!!! How the heck did that happen? As for the neighbour, well, it was not a good time but as I said, I will be writing about it shortly. Lovely pic of your chicks . What an amazing life you have had Sherri – neighbours shooting at you! Can’t wait to hear about that story sometime. Thanks Jenny, I’m glad I get to share these pics here, especially this one as one of my all-time faves!! Ha! Yes, all true. Think I better get on with writing about it judging by the response to my mention of a certain little bedtime story!!! Hi Tieshka! Thank you, yes, I did enjoy making my daughter her little dresses and so glad I got that out of my system, lol! Wow, underwater? That sounds amazing! How lovely to spend it at Pismo. Hope you all have a great time! A beautiful photo Sherri! It sure fits the challenge well. Aspie D’s Easter dress is adorable… great job of sewing. If I remember correctly, sewing pieces of gathered fabric together isn’t easy. You have so many interesting stories to tell… can’t wait to hear the one about your crazed neighbor! Thanks so much Theresa, I’m happy to have been able to share this favourite photo of mine with you. Haha! Yes, I did enjoy sewing but with a pattern it isn’t so bad. Making small dresses like these is better than full size but yes, gathered fabric can be a hassle, I agree. Many times it’s unravelled on me…! Wonderful photo, and your daughter looks adorable in that dress. I remember having an easter bonnet for a ballet performance when I was your daughter’s age. It was a plastic lace doily with flowers sewn on it! The doily came from Woolies I expect. Ahh, thanks Susan, so glad you enjoyed this photo, one of my faves!! I loved seeing my daughter in her little dresses! Hi Jo. Yes, this is the one to bring joy and laughter. I’d title this precious picture as “All Dressed Up And No Way To Be Solemn”–what a wonderful ‘capture’ of all three of them! I loved to sew, too, Sherri, and until Molly was in 3rd grade, each Easter I not only made her a dress…I also made a matching one for me. The same material, but different style. She loved it (and learned how to pick out fabric and patterns and sew on buttons) until she was about 9. Then she was aghast that we’d wear Mother-Daughter dresses. Haha! I love your slogans Marylin and yes, this one would be perfect! Ahh, you know, I made a matching dress for myself once or twice too! I love that you did that, isn’t it so wonderful to have that experience? But that’s the thing, it is short lived! That is a great photo – makes you happy just to look at it and what a dress! I do remember always getting new clothes for Easter. We weren’t churchgoers, but we’d go to town to watch the ‘marching’ where the kids from the local churches would parade around, then a cup of tea and a hot cross bun at the local café – traditions long gone now. Thank you Andrea! Yes, this photo makes me smile just thinking about it! We weren’t churchgoers growing up but I did take my own children to Sunday school in their younger years until they no longer had much desire to go. Really cute and upbeat picture. I totally understand you treasure that one. That makes you smart, not awful 😉 A mother also need to take oppertunities while they’re still there. When girls grow up, they create their own taste and dresses might not be part of the wardrobe anymore. At a certain age range, they were prohibited from my closet as well. 🙂 They got back in later, though. This photo is so adorable, Sherri! Your children are so fortunate to have you for a mom! Or “mum” as you say over there on the other side of the world! 🙂 That’s a great Easter story. You have inspired me to write about the night before Easter in 2006 when my mom passed away. I haven’t been able to do it, but I’m going to try. Thank you for sharing your gifts of writing and photography with the world. Hi Patsy, so sorry it’s taken me so long to reply to your lovely comment, I seem to have been missing some notifications from several readers but think it’s resolved now so at last catching up!! Always something, eh?? Anyway, I haven’t started on writing about my mom yet. I’ve been working on drawing a hummingbird for Jill W. instead. But I’ve also been doing other writing. And my friend’s having the memorial service for her husband this Friday who passed away from liver cancer a couple of weeks ago. That’s going to be tough for all of us. God bless you, too, Sherri. Big hugs to you! That’s okay, Sherri. I was just wondering if it failed to get to you. No hurries. I know how busy you are! I have loved hummingbirds since we moved here. I never saw them in the city when we lived there 15 years ago. They are beautiful creatures indeed! Thank you for your prayers on Friday for Jackie and her family. I appreciate that so much!